Is not three young ladies for wards. Nor is the responsibility for finding them a governess. Thankfully that is delegated to his housekeeper, who he might add is blind as a bat. That really could be the only excuse she has for hiring Carlotta. Because Carlotta is far too beautiful to be a governess. Unable to restrain himself—because restraint is not one of his virtues, his reputation is testament of that fact—he finds the young governess far more spirited, opinionated and tempting than he is able to resist. And of course, because he’s an idiot. He falls in love. Never questioning whether she’d be a willing participant. Of course life isn’t that easy, not even when you’re a bloody duke. Three wards decide to take matters into their own hands. Because what the duke wants…is simply to fall in love (preferably with the young woman in mind, falling in love too. Yes that is the blurb, it's not the best written or formatted. Yes it tells what the book is about but come on. Carlotta is the daughter or a baron. Now she is a poor orphan, so she becomes a governess. And suddenly she is all, I know my place, it is below the stairs..but hey, your dad was still a baron. Charles is a Duke. A young handsome Duke. Suddenly he had 3 wards and is all hell no! But one look at the hot governess and he is all hell yeah! I did like that he wanted her from the start, and he wanted to do right by her. She was the one who was all but I am a governess! He was also a bumbling fool at times, and that is always nice. It was a sweet one. No smexy times before the wedding here. After an inconvenient display of mercy in the arena, the gladiator Anazâr is pulled from the sands and contracted to nobleman Lucius Marianus to train his new stable of female gladiators. His new charges are demoralized and untested, and they bear the marks of slavery and abuse. Anazâr has a scant four months to prepare them for the arena, and his new master demands perfection. Anazâr’s surprised by how eager he is to achieve it—far more eager than a man motivated by only self-preservation. Perhaps it’s because Marianus is truly remarkable: handsome, dignified, honorable, and seemingly as attracted to Anazâr as Anazâr is to him. But the rivalry between Marianus and his brother, Felix, sparks a murder conspiracy, with Anazâr and his gladiatrices caught in the middle. One brother might offer salvation . . . but which? And in a world where life is worth less than the pleasures of the crowd or the whims of a master, can there be any room for love? As a gladiator, Anazâr's defenses are near impenetrable. But as a man, he learns to his cost that no armor or shield can truly protect his heart. Look at that, I read a MM without knowing it. Well, I realised it after reading a bit. Anazar is a slave and gladiator. And then he gets "hired" to train female gladiators. Some of the smex scenes bothered me. He is a slave. Someone tells him something so he does it. I am just not ok with that. That is not smexy to me. It is not historically heavy, the author tries to get by on little (to me at least), but then it is a romance so it does not have to. There was also a suspenseful part, well sort of. You will see. Interesting, with a happy ending. Yes it is a romance, but I still did not think it could happen. They sound good. The first one has a lovely cover. The first one does sound cute. Oh, and I read that Gladiator one. Yeah, that situation was a tough one to read. Not sure for the second one but wow green eyes for the first one. 2) Meh...I agree with that not being smexy. It's crazy. What were they thinking? 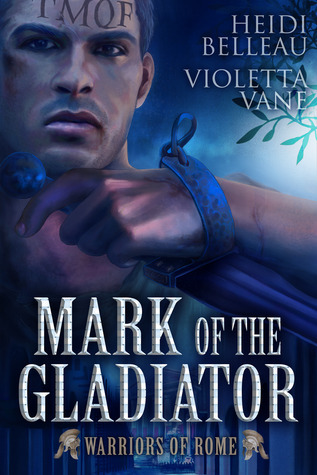 Wow - Mark of the Gladiator is so not what I'd expect you to read. I think I have the Gladiator one on my kIndle. Your reviews are always fun to read. Lol. So candid.